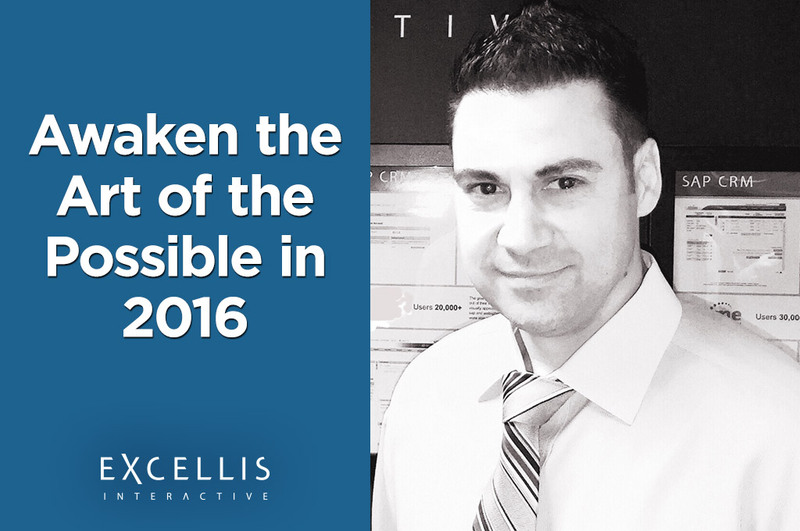 Is your business poised for greatness in 2016? Perhaps it is adequate, or even good. But what is holding back your business from standing out against the competition? Is it a lack of a mobility strategy? Outdated technology? These are mere challenges – not problems. It’s time for you to explore the art of the possible. The art of the possible means never settling for less than greatness. I view technology as an extraordinary asset that should always be exploited to the fullest. In 2015, Excellis pushed the envelope thanks to open source UI5. We manipulated UI5 and and Titanium Appcellerator technologies to create custom iOS applications, and we seamlessly integrated an SAP mobile platform front-end with a JD Edwards ERP backend system to create a custom UI5 solution. THAT’s the art of the possible. My number one goal for my clients is to provide them with the fundamental tools necessary to achieve (and exceed) their businesses’ goals. Not just today but for the foreseeable future. Anyone can solve a problem and move on to the next – but that’s often times like putting a bandage over a gunshot wound. It takes someone with expertise and precision to offer long-term solutions. As an SAP Mentor, I’ve seen far too many quick fixes go awry. A truly sound strategy enables businesses to provide greater user experiences, greater scalability, and faster time to market. But it also takes expertise in implementing technology to make this happen. Those, blended with the right architecture, provide my clients their roadmap to success. Where will the art of the possible take us in 2016? hybris and Salesforce.com offer lightweight UIs to easily achieve great user experiences, and their open standards will pave the way for endless integration possibilities. This year, we expect B2C to become more intimate. Customers will continue to not only seek, but demand, engaging and seamless experiences across all channels. Do you have the right tools to exceed the expectations of your users? Perhaps it’s time you asked the question – how can I achieve greatness with my existing investments? If you don’t know, Excellis is your answer. Myself and the rest of the Excellis leadership team are here in Las Vegas for SAP’s Field Kickoff Meeting. We’re excited to talk about our current projects that showcase the innovative ways we’re bringing the user experience to the forefront while simplifying SAP applications. We’ve always been in the business of simple, but in 2016 we’re making things #SimplyBetter. I’d love to discuss more about the art of the possible with you for your business – drop me a line at plagana@excelliscorp.com!